The immigration issue continues to rip the EU apart from within. The EU’s nations are pulling further apart from each other depending on whether globalists or nationalists are in charge in the various nations. One does not need to be a rocket scientist to look at the developing pattern and wonder when an outright breach will occur within the EU. The bureaucrats in Brussels may be “playing the tune” about the EU’s future, but an increasing number of nations are not willing to “march” to the EU’s tune. The latest fracture within the EU comes from an alliance of Hungary and Italy to actively oppose and reverse the EU’s immigration policies. The first link reports that Hungary’s Prime Minister Viktor Orban and Italy’s Interior Minister Matteo Salvini agreed to an alliance to stop the EU from allowing more immigrants into the EU. The link reveals increasing ill will between Italy and France over the immigration issue. 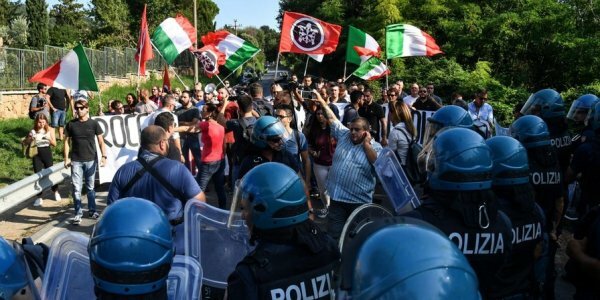 Italy is threatening to veto the EU’s budget unless the EU alters its immigration policies, and the EU is threatening to withhold EU funds from Italy unless it submits to the EU policy. The second link adds that the Czech Republic, Poland, Slovakia and Austria are also in the Hungarian-Italian alliance. It also has a noteworthy comment that goes to the crux of the growing EU internal feud. It state that Austria has voiced the position that it “stands in defense of the right to remain national states instead of becoming part of a federalist entity led by the French-German alliance.” An increasing number of nations want no part of any Franco-German EU “Anschluss” against the sovereignty of other European nations. The United Kingdom’s Brexit vote passed to a large degree due to this same opinion. Indeed, it seems that the harder the EU-German-French alliance pushes for the EU to become a sovereign government over all of Europe, the quicker the EU will come apart. The third link adds that the nationalist camp within the EU nations intends to make the March 2019 European Parliamentary Elections nation-wide referendums on the EU’s immigration policies. The nations already led by nationalist governments intend to reach out to such out-of-power nationalist leaders as Geert Wilders in the Netherlands and Marine Le Pen in France to join their nationalist coalition in those elections. France’s Emmanuel Macron is the leader of the EU/globalist camp and he is allied to Germany’s Angela Merkel. However, Merkel leads a very shaky German governing coalition that is being held together only by the common fear that the nationalist, anti-immigrant Alternative for Germany Party will expands its share of the vote in any new election and force its way into any new governing coalition. The fourth link confirms that Hungary is very closely allied with Poland in a common stance vs. the EU’s immigration policies. Relations between the EU and Poland are downright hostile, but Poland has enough friends within the EU’s nationalist camp that it is difficult for the EU to successfully sanction Poland. Additionally, both Poland and Hungary have taken positions that they are Christian nations which are defending their national culture vs. a tidal wave of Islamic immigration. If the EU attempts to stop EU funding for Italy, Italy would likely hold a national referendum on whether to leave the EU and abandon the Euro currency. In previous posts, I have cited the very accurate maxim cited in Amos 3:3 of the Bible which states: “Can two walk together except they be agreed?” The nations of the EU are increasingly in deep disagreement on immigration and sovereignty issues, and the dissension is becoming more intense. At some point, the EU cannot continue in its current form. There is a larger question: If the EU comes apart, how can the Euro currency survive? Perhaps it can survive as a “core Euro” of some kind led by the Franco-German alliance, but that is not clear. The nationalist sentiment inside France and Germany is growing steadily stronger, and the EU globalists cannot take it for granted that France and Germany will always have pro-globalist governments. There are so many loans, banking contracts, trade deals, derivatives, etc. denominated in the Euro currency that if the Euro currency’s survival becomes at risk, it could quickly cascade into a sell-off of the Euro that destabilizes the entire global monetary system. The book of Revelation prophesies in chapters 17 and 18 that a global financial/monetary crisis will occur during the latter days of our age that crashes the current globalist financial system, and that it will be replaced by a new global financial system with new leaders. The language of that prophecy argues that there will be a currency crisis. Revelation 17:11-24’s language presents a situation where the “merchants of the earth” have plenty of goods and services to sell, but that “no man buys their merchandise any more.” Since the demand for many types of goods and services is inelastic, this prophesied circumstance must mean that global currencies and money systems have collapsed. There are no more trustworthy mediums of financial exchange. The chaos that this situation will cause should be obvious to all readers. I am not predicting that an EU-break-up and a run on the Euro will cause this prophecy to be fulfilled, but it is one possible trigger for such an event. Whatever the trigger for this future collapse, there is something in the prophecy in Revelation 18 that everyone should take very seriously as proof that there is a Creator God who is guiding his prophecies to fulfillment. Revelation 18 states in three different places (verses 10, 17 and 19) that this eventual, prophesied, global financial crisis will occur “within one hour.” This language was seen as purely metaphorical in the pre-computer age, but as all economies, currencies and markets have now become digitally interconnected, a sudden crisis in one part of the global financial system could literally cascade into a systemic failure of all markets “within one hour.” That this prophecy in Revelation 18 could have foreseen so accurately what can happen in the modern digital environment argues strongly that the God who inspired this prophecy almost two millennia ago is, indeed, the Creator God. For more detailed information about the above topics, I urge you to read my free articles, Are We Living in the Biblical Latter Days?, Is Babylon the Great about to Fall…Ushering in a New Beast System? and The Babylonian Origin of the Modern Banking System. If you read these articles, you will see modern world events in a brand-new perspective that only an understanding of biblical prophecies can provide.